Gerhard Richter's groundbreaking study argues that the concept of "afterness" is a key figure in the thought and aesthetics of modernity. It pursues questions such as: What does it mean for something to "follow" something else? Does that which follows mark a clear break with what came before it, or does it in fact tacitly perpetuate its predecessor as a consequence of its inevitable indebtedness to the terms and conditions of that from which it claims to have departed? Indeed, is not the very act of breaking with, and then following upon, a way of retroactively constructing and fortifying that from which the break that set the movement of following into motion had occurred? The book explores the concept and movement of afterness as a privileged yet uncanny category through close readings of writers such as Kant, Kafka, Heidegger, Bloch, Benjamin, Brecht, Adorno, Arendt, Lyotard, and Derrida. It shows how the vexed concepts of afterness, following, and coming after shed new light on a constellation of modern preoccupations, including personal and cultural memory, translation, photography, hope, and the historical and conceptual specificity of what has been termed "after Auschwitz." 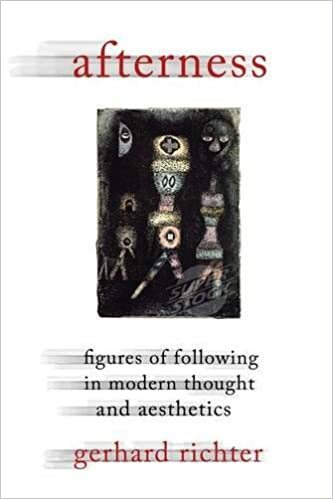 The study's various analyses—across a heterogeneous collection of modern writers and thinkers, diverse historical moments of articulation, and a range of media—conspire to illuminate Lyotard's apodictic statement that "after philosophy comes philosophy. But it has been altered by the 'after.'" As Richter's intricate study demonstrates, much hinges on our interpretation of the "after." After all, our most fundamental assumptions concerning modern aesthetic representation, conceptual discourse, community, subjectivity, and politics are at stake.